My flight to London was uneventful, and by 8:30 am my new passport had its first stamp and I was in the Tube on my way into the city. I dropped my suitcase at the hotel, where I ran into Bora Zivkovic and his family (they were on on the same schedule but different flights), so we made our way to a nearby coffee shop for a jolt of caffeine. I then split off and found a seat in the British Library to check email and work on the prezi that Bora and I will use for our discussion session at Science Online London tomorrow. Lunch time, and so I headed to the London Bridge Tube station and nearby Borough Market, where I wandered through the stalls and streets, tasting samples and noticing what the Londoners were buying for their lunches (also noticed how narrow and fitted the men’s suits were, similar to the styles in New York when I was there earlier this year, and something I need to adopt). I stopped into Neal’s Yard Dairy and walked out with 252 grams of Westcombe cheddar, which I’m nibbling now in my hotel room. 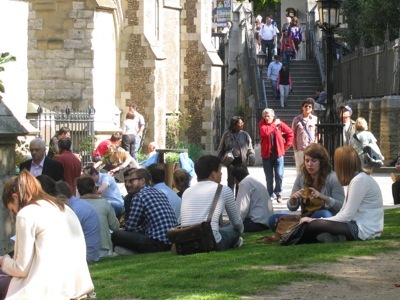 I also bought a serving of Vietnamese-style green curry and rice, then found a seat on the lawn of the Southwark Cathedral — site of a church since 606 A.D. — and with the sun on my back and the conversations of people all around, enjoyed a perfect lunch. 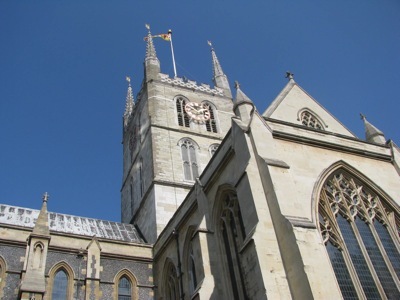 From the market and the cathedral, a walk along the Thames to Tate Modern, a huge building with not as much art as I expected. I was too tired and hot and sweaty to go through with my plan to see the Miró exhibit, so I returned to the hotel and met Bora and family again. I’ve just woken from a nap, written this post, and will now step out for a walk. Busy days ahead with the conference, then more sightseeing and activities. I’m in London until Tuesday.